How can something so small have a powerful punch? Nuun offer 'optimal hydration' in their tablets that about the size of a US nickel. The folks at Nuun were nice enough to share with me 2 flavors0 Tangerine Ginger from the Natural Hydration line and Strawberry Lemonade from the Active line. One tube contains 12 tablets which are scored in case you want to split them. The tube offers protection from the tablets crumbling and fits perfectly into your pocket or gym bag. The website also points out that the tubes are "Good for the Earth: One tube prevents the manufacture of up to twelve 16oz plastic bottles from sugar-ADE sport drinks." Excellent point and even better if you are using a reusable water bottle! 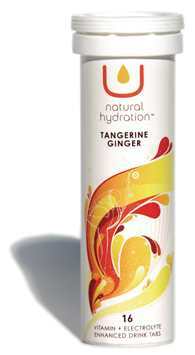 First, I tried Tangerine Ginger and didn't like the taste too much. I think this was because I expected an orange flavor similar to orange squash or other sports drinks. But the next time I had it, I found the taste refreshing. After my long run, it helped me rehydrate. The tablets did take a few minutes to dissolve on their own, but if you stir or shake your drink it takes less time. My office mate, Fraser, volunteered to try Strawberry Lemonade over the weekend. He had a night out planned, as well as a long bike ride. He reports that the tablet was an "awesome" hangover cure but wasn't too fond of the flavor. (He just added it is worth sacrificing the taste for the hangover cure as he didn't loose an entire day in bed with a headache.) On his long ride (50+ miles), he found it Nuun helped him effectively rehydrate. I tried the Strawberry Lemonade and found it wasn't super sweet (as I am accustomed to American lemonade) and slightly carbonated. The tablets are only 8 calories each and provide you with vitamins too. If you don't like the taste of water but want something healthier and low-calorie, keep a tube in your bag. I have a feeling this will be my go-to in the hot summer months when I am training people outdoors.